Combining the bubinga with birch makes for an interesting blend of characteristics that brings out the best of each wood. Another solid pro-level kit from a brand firing on all four cylinders. Bringing birch into the equation makes the kit cheaper. Dazzling finish. Up-to-the-minute sizes. You'll need a lot a space for the long kick. Tama has become one of the more prolific users of bubinga in recent years, with the African hardwood featuring prominently in the company's high-end Starclassic range. The bubinga/birch hybrid shell that this Starclassic Performer kit is built from has been around since 2006; what's new about this kit is the shell pack that includes Hyper-Drive tom lengths and the selection of finishes on offer. Bubinga is over 50 percent harder than maple and birch and is renowned for providing immediate attack and rich lows. While this density endows it with impressive acoustic qualities it also makes it trickier to work than a lot of woods. It's also not as abundant as the usual drum staples (birch, maple, mahogany) and so carries an extra premium. In theory, the combination of bubinga and birch ought to give brilliant attack with a solid bottom end; put another way, birch with an extra oomph. The shells for the toms, floor toms and snare are all seven-ply and 6mm thick. Birch accounts for the outer four plies, while the bubinga makes up the inner three. The bass drum is a slightly thicker eight-ply and stands 8mm thick. Bubinga is again used for the inner three plies, leaving the birch making up the remaining outer five plies. "The die-cast hoops make a big contribution to the snare drum's sound... flicking in the occasional rimshot moves things dangerously close to ear-shredding territory"
Four off-the-shelf shell packs are available (including a one-up, one-down four piece), as are a wide choice of individual drums. This kit is comprised of a 22"x20" bass drum, 10"x6 1/2"/12"x7" rack toms, 14"x12"/16"x14" floor toms and a13"x6" snare drum. Among the six new lacquer finishes announced for 2009 are two sparkles. The review kit is an example of one of these: Crystal Blue Burst (see the image above). Based on a warm shade of powder blue, the paint contains a multitude of light-catching metallic flakes. While spread evenly across the length of each drum, they are at their most effective in the lighter central bands. Inside the shells, the dark tobacco hue of the bubinga is set off by black hardware fittings. In common with all Starclassic kits die-cast hoops are fitted as standard across the drums, with the obvious exception of the bass drums, which have wooden hoops in matching lacquer. 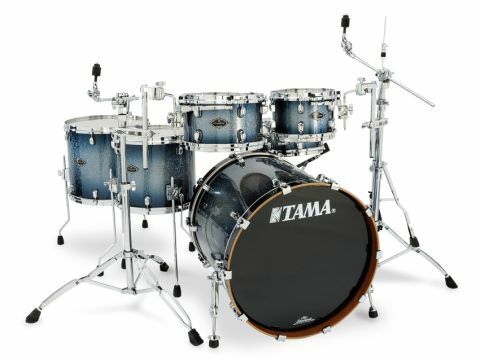 Chrome-plated aluminium Star-Cast mounts are fitted to both the rack toms, while Tama's air-cushioned rubber tips are found on the floor tom legs. Many other usual Starclassic refinements - too numerous to list here - are found across the kit. The kit is fashionably sized, with the super-long undrilled bass drum paired off with short Hyper-Drive toms and reduced length floor toms. Hyper-Drive toms were devised to encourage a quicker response and punchier sound. Applied to toms made from a bubinga/ birch sandwich the effect is intensified further. "There is no denying both the visual and acoustic presence of this drum"
Rattling round the toms brings forth a fusillade of sharp, but intriguingly bass-rich, tones. The best results were to be had by not taking the tuning too far above mid-tension. There the fatness of the bubinga combines well with the startling attack. Even with the tuning dropped low the toms are capable of cutting through - the influence of the die-cast hoops keeping a certain tightness to the sound. The die-cast hoops make a big contribution to the snare drum's sound too. Tuned up, it delivers a biting, clipped snap that leaps out of backbeats and makes fills and freer snare drum work a joyful indulgence. Flicking in the occasional rimshot moves things dangerously close to ear-shredding territory. At 13" in diameter, you'd expect the snare to be situated at the high, clean end of the spectrum and this is where it shone the brightest. However, its authority is undiminished through a range of tunings - at laughably slack tensions there is still a hardness to it that demanded attention. The bass drum is similarly primed to attack and it punches out taut, low notes with ease. Beneath the initial hit sits a rich note that is fat and warm without running to excess. For such a large drum it is surprisingly dry and only requires the bare minimum of dampening. While you might not be the greatest admirer of long kicks - purely on the practicalities of living with one - there is no denying both the visual and acoustic presence of this drum.